These are the last words uttered by 17-year-old Max Stein’s best friend Evan just moments before he kills himself after hacking into the live-streaming Presidential debate at their high school. Haunted by the unforgettable image of Evan’s death, Max’s entire world is upended as he suddenly finds himself the target of a corporate government witch-hunt. Fearing for his life and fighting for his own innocence, Max goes on the run with no one to trust and too many unanswered questions. 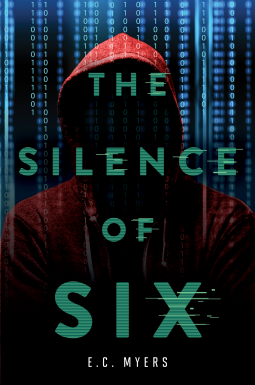 Max must dust off his own hacking skills and manoeuvre through the dangerous labyrinth of underground hacktivist networks, ever-shifting alliances and virtual identities- all the while hoping to find the truth behind the “Silence of Six” before it’s too late. First off, can I just say that this cover is amazing? Yeah, it is. I love how it’s not your typical person on the cover but it actually relates to the story in a really clever way. My copy is in hardback (actually that might be the only format you can get) and the actual hardback without the dust-jacket is just simple and plain but when I read it in school I would take it off so people would think I was reading a classic… Yes I am that sad. But thank you The Black Rabbit for making me look smart! Anyway, let’s get onto the actual book. Before reading this, I was really nervous I wouldn’t understand any of the hacking references because whilst I can use my iPhone well, I can’t do much else- can you tell I dropped I.T? I was pleasantly surprised to find that I actually understood everything really well! Everything was explained in a really concise, understandable way and I really appreciated that. Anyway, this book really pulled me out of my devastating reading slump and dragged me along this fast-paced journey. I couldn’t put this down and I loved every second of this book so much, I wasn’t bored for a second! Let’s talk about the characters. Max. What a fantastic character! I really liked the way he was developed and the way you got to see some of his past and how he had to revisit it in order to help his best friend. I loved his voice and he didn’t annoy me in anyway, I loved having him as a main character. A character I didn’t like through most of the book, however, was Courtney. Ugh, that girl drove me insane! At the beginning of the book you think she’s a good girlfriend to Max and then you see how little she knows about him and how little she understands him and how angry she gets and ughhh! Anyway, now I’ve ranted about her I can finish! I loved this book so much, it was absolutely fantastic! It made me wish I had hacking (or at least computer) skills, but sadly I don’t. Just as a quick side note, I cried at the ending. And it is definitely not your usual ending to cry over. If any of you guys have read it you’ll probably be thinking “what is she on about?”. But I am just a huge cry baby when it comes to books and yeah… There’s my confession! Thank you guys so much for reading this! I hope you enjoyed it! Comment down below letting me know what you’re reading or if there is any book you want me to review for you! The goodreads link for this book is down below so you can go and check that out- and I really recommend you do! All my social media links are there too so you can keep up to date with what I’m reading and everything like that! Previous Previous post: Reading Slumps! The Wrong Train Blog Tour! An Interview With Marcus Sedgewick! An Interview With Anna Michels! Is This BookTube You Say?! yourbestbookpal Create a free website or blog at WordPress.com.